Last night was the turn of my friends Nick and Kerry to help me clear my cupboards. In the spirit of my self-imposed challenge to use up as much food as possible before I move out of my flat next month, I set out to make a meal that involved only dry goods and store-cupboard essentials that I already had – buying only fresh stuff. And I pretty much succeeded. So, clockwise from the top, the menu consisted of chicken poached with saffron and cinnamon, baked saffron cauliflower (both of which I’ve written about in previous posts), spicy Iranian potato croquettes (from good old Claudia Roden’s New Book Of Middle Eastern Food) and, lastly, a recipe of my own, spicy tomato and spinach couscous, which is flavoured with my Turkish pul piber/tomato paste and some fresh oregano. We also ate our way through a fair amount of the rosemary and nigella seed sourdough I wrote about in my last post, accompanied by a piece of lovely strong Spanish cheese (another recommendation from my friend over at The Aubergine Files, the name of which I can’t actually remember – but hopefully he’ll let me know what it was…). Pudding was a concoction of crème fraîche, Greek yoghurt and raspberries, topped off with some of my lemongrass and ginger biscuits (I had some of the dough in the freezer, left over from the last time I made them). So, as well as getting through good amount of spices, dry goods and bits and bobs from my freezer, I also served up a pretty cosmopolitan selection of dishes – with elements from Iran, Turkey and France, Greece, Thailand and Spain, it was a veritable world tour in one kitchen. When growing up, my sister and I were lucky enough to have been exposed to some rather unusual foods – unusual certainly for Britain in the 1970s. My mum was always an adventurous cook, but she and my dad had so many international friends – Indian and Pakistani, Italian and French – that she picked up lots of recipes from them over the years. 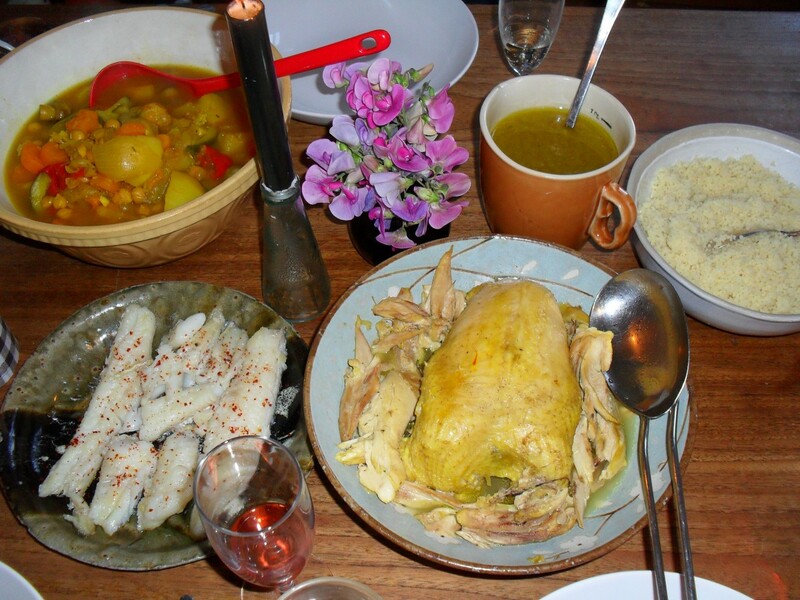 Punjabi chicken curry, fresh artichokes with vinaigrette, spaghetti bolognese (in the days when most Brits thought pasta only came in a tin) all made regular appearances on our kitchen table. 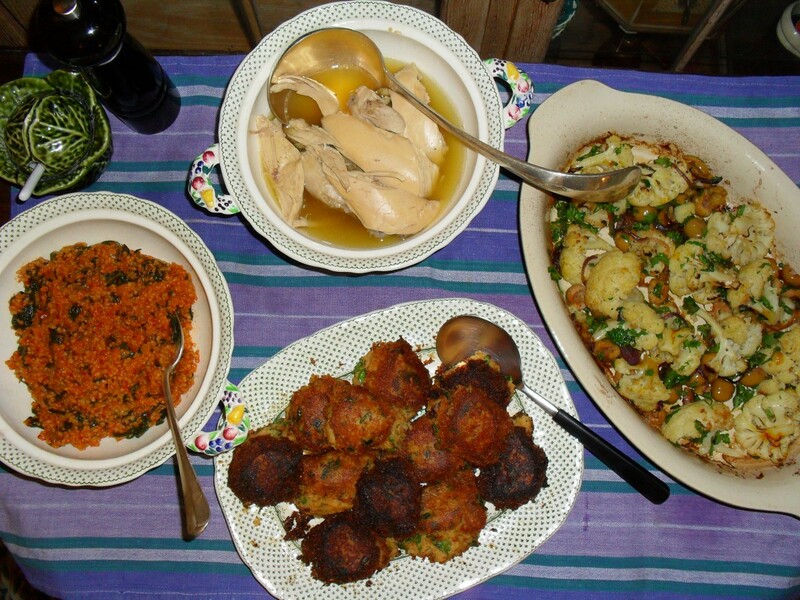 But, my absolute favourite of all these exotic dishes was chicken couscous – by which I mean the proper caboodle of broth, vegetables, chickpeas, chicken or lamb and harissa, plus steamed couscous. Mum would poach a whole chicken in an enormous pot with baby turnips, carrots, onions and chickpeas, all simmering in a delicious broth tinged bright yellow with turmeric. 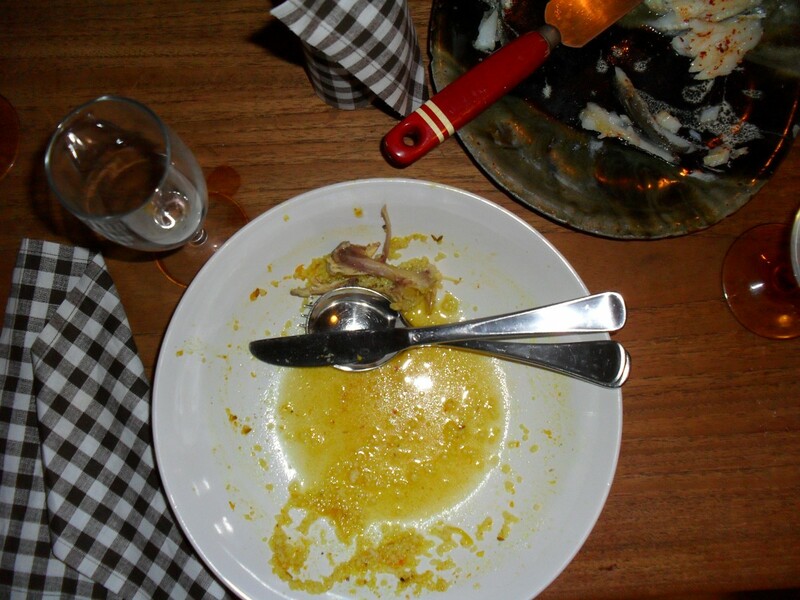 On top of the broth would sit a vast sieve-full of couscous, steaming to soft perfection. She always made far more than a family of four could possibly eat, but that family of four would inevitably eat it all! (I don’t know what it is about couscous, but I just seem to be able to fit an inordinate amount of the stuff in my belly.) 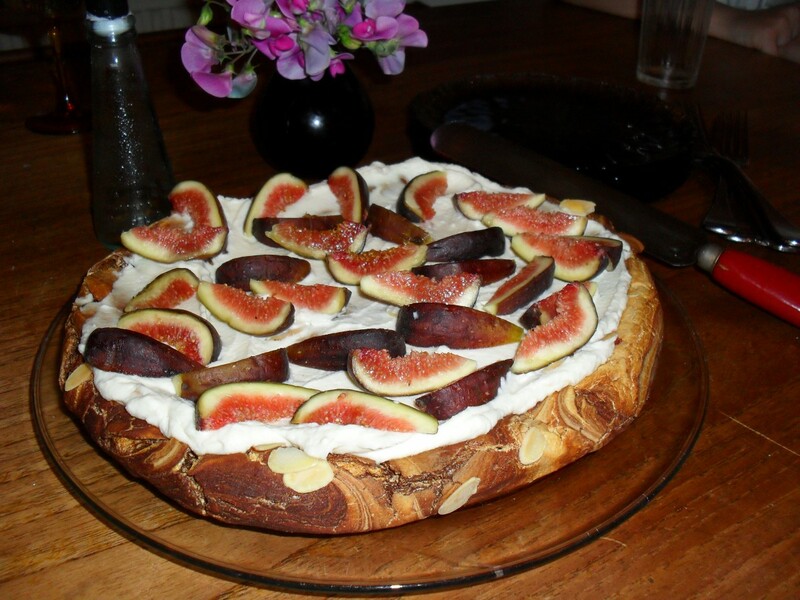 I can still remember the first time I cooked it myself, as a student in London, after phoning Mum for her recipe – and the friends I have since cooked it for have, without fail, loved it as much as I do. I still cook it fairly regularly, and every now and then, I have such an urge for those familiar flavours, that really nothing else will do. Which is what happened last night. The only thing was, I had taken a mackerel out of the freezer, and I really needed to eat it, or it would have to be chucked. 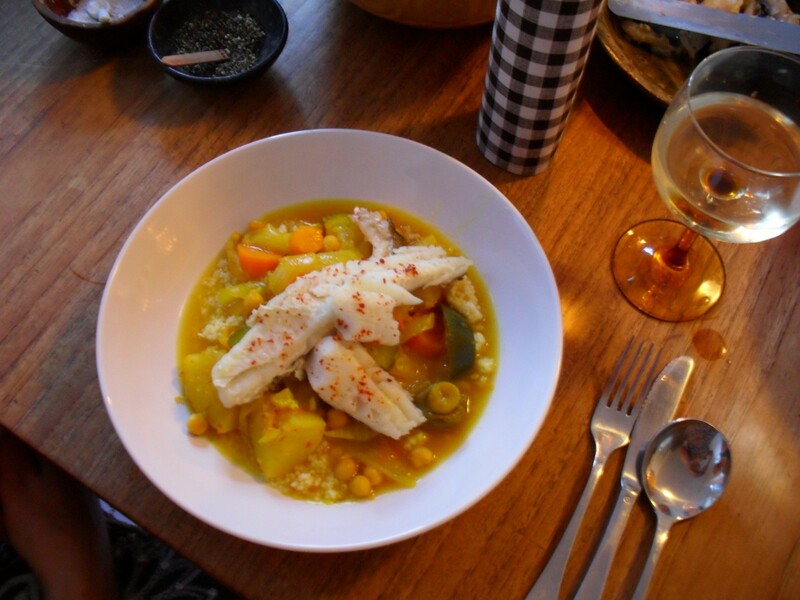 Now, I know that there are fish couscous recipes, but I have to admit, I’ve never made one. So, turning to my trusty copy of A New Book Of Middle Eastern Food by Claudia Roden, I found just what I was looking for. 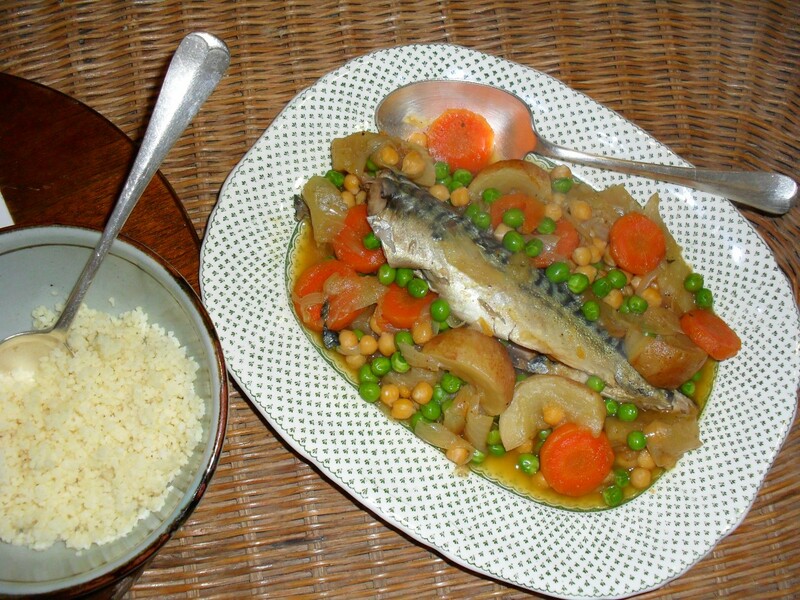 The recipe I used was described by Claudia as Tunisian in origin, and she said that any kind of fish could be used. I’m not entirely sure that mackerel was the best thing for it, but it worked well enough for me. I’ve become a bit lazy when it comes to cooking couscous these days, and usually just steep the grains in boiling water until they are soft. But I decided to make a bit of an effort with this dish, and cook it properly. 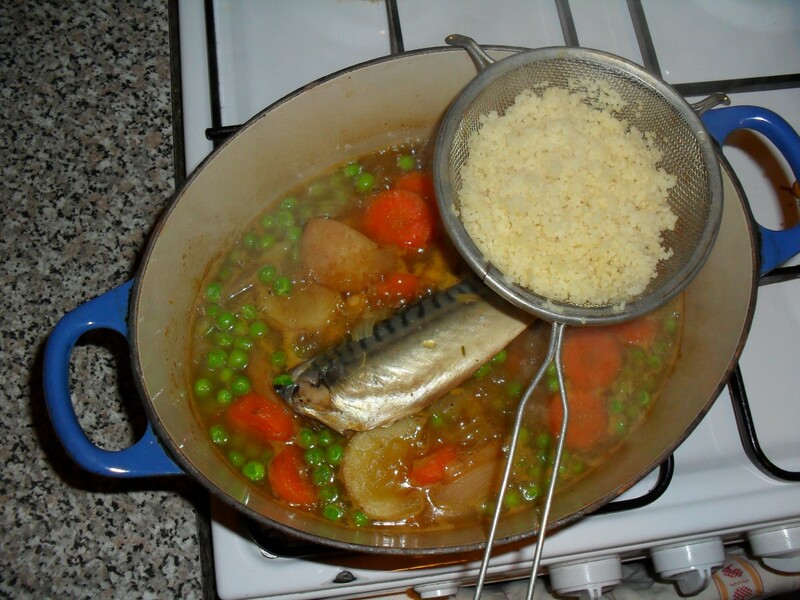 Which is why you see the sieve sitting atop the fish and broth in the picture above. This is a dish that is quite hard to make in small quantities, so I made a pretty large pot, intending to finish it off today. However, that plan somewhat fell by the wayside once I’d started digging in. And, reader, I ate the lot!